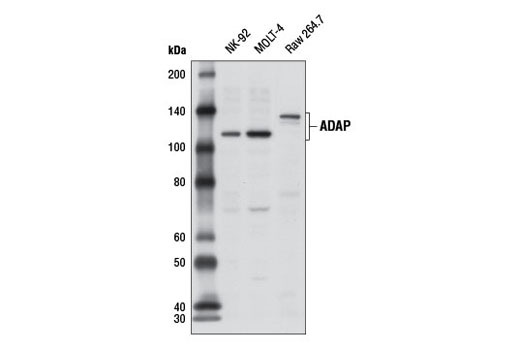 Western blot analysis of extracts from NK-92, MOLT-4, and Raw 264.7 cells using ADAP Antibody. 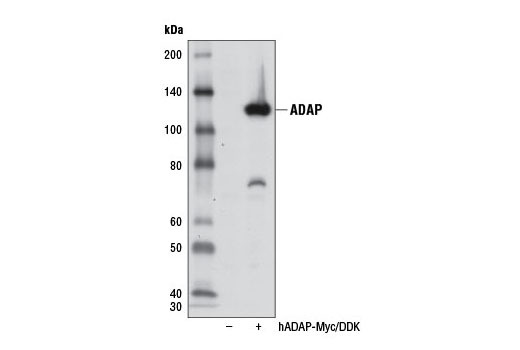 Western blot analysis of extracts from 293T cells, mock transfected (-) or transfected with a construct expressing Myc/DDK-tagged full-length human ADAP (hADAP-Myc/DDK; +), using ADAP Antibody. ADAP Antibody recognizes endogenous levels of total ADAP protein. Polyclonal antibodies are produced by immunizing animals with a synthetic peptide corresponding to residues surrounding Pro731 of human ADAP protein. Antibodies are purified by protein A and peptide affinity chromatography. ADAP (adhesion and degranulation-promoting adaptor protein/SLAP-130/Fyb) is an SH3 domain-containing adaptor protein expressed by T cells, NK cells, and myeloid cells (1,2). There are two isoforms of ADAP with predicted molecular weights of 85 kDa and 90 kDa, but observed molecular weights of 120 kDa and 130 kDa (1-3). ADAP was identified as an adaptor protein that interacts with SLP-76 following T cell receptor (TCR) stimulation and was subsequently found to be important for several aspects of T cell activation (1,2). For example, ADAP is required for integrin-dependent clustering, signaling, and adhesion (4,5). In addition, ADAP interacts with CARMA1 and facilitates assembly of the CARMA1-Bcl10-MALT1 complex important for NF-κB activation downstream of TCR activation (6). Finally, following binding of a T cell to an antigen presenting cell, ADAP forms a ring at the immunological synapse that recruits dynein to enable microtubule-organizing center polarization (7). Musci, M.A. et al. (1997) J Biol Chem 272, 11674-7. Schraven, B. et al. (1997) Immunol Lett 57, 165-9. Veale, M. et al. (1999) J Biol Chem 274, 28427-35. Griffiths, E.K. et al. (2001) Science 293, 2260-3. Peterson, E.J. et al. (2001) Science 293, 2263-5. Medeiros, R.B. et al. (2007) Science 316, 754-8. Combs, J. et al. (2006) Proc Natl Acad Sci U S A 103, 14883-8.